Hubby loves rice pudding. In the absence of rice pudding, he'll sometimes pour milk over leftover rice and sprinkle it with cinnamon. 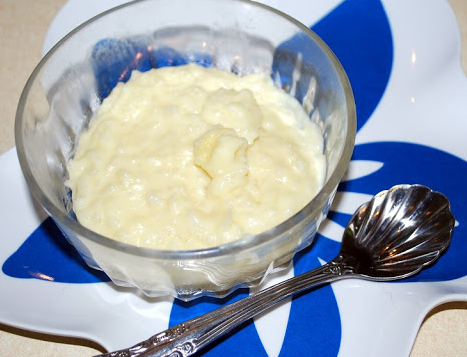 To me, that's SO not the same thing, but my early-married-attempts to make rice pudding were less than spectacular, so he was stuck with rice'n'milk for many years. Then one day we had some leftover rice and I whisked it away to the refrigerator so I could save it and make REAL rice pudding. It can't be that hard, right? And it wasn't! This recipe is wonderful, easy, and delicious! I used this one from allrecipes.com. To make it, you'll need 1 1/2 cups of leftover rice, 2 cups milk (divided), 1/4 teaspoon of salt, 1 egg, 1/3 cup white sugar, 1 tablespoon of butter, and 1/2 teaspoon of vanilla extract. Start by combining the rice, 1 1/2 cups of the milk, and the salt in a saucepan over medium heat. Cook and stir until the mixture is thick and creamy. When it begins to boil, turn down the heat a bit and keep stirring so it won't burn on the bottom of the pan. Cook for about 15-20 minutes. Then add the remaining half cup of milk and the egg, beaten together, and the sugar. Mix together in the pan and continue to stir as it cooks and bubbles, for an additional 2-3 minutes. It should be nice and thick. Spoon into serving dishes and serve warm or cold, with nutmeg or cinnamon sprinkled on top if you like. Both are good; I like nutmeg best and hubby prefers cinnamon. The original recipe calls for golden raisins but they are optional. We like it without raisins. What a simple, delicious and easy dessert. It makes any meal feel elegant and yet this homemade rice pudding is so inexpensive to make. You can easily double the recipe if needed. Hubby feels spoiled whenever I make it; your family will too. This post contains affiliate links; if you click on a link and make a purchase I might make a small commission but it doesn't affect the price you pay. Read my disclosure here. Oh yummy! Printing it out right now to make later this week after we have rice with our Tuesday dinner. Thanks for sharing! Thank you, Linda, I'll hop over and do that now. Oh, I love rice pudding cold with golden raisins and almond slivers. This looks great. Thanks for the recipe. Thanks, Holli. I haven't tried it with almond slivers; that sounds delicious!